Dottie 'Doc' McStuffins, a six year old girl, 'fixes' toys, with a little help from her stuffed animal friends, Stuffy, Hallie, Lambie and Chilly. Your stuffed animals and toys have never been more excited to get their check up's! 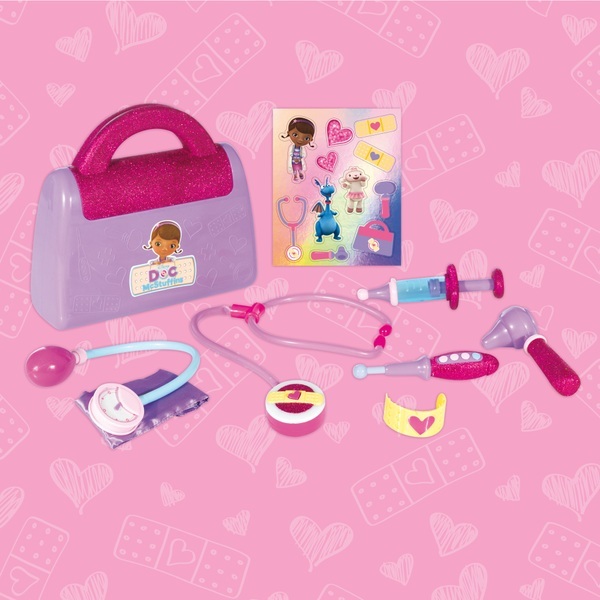 Doc McStuffins Doctor's Bag Playset includes 8 glittery and sparkly pieces - Doc's bag, play thermometer, syringe, blood pressure cuff with working gauge, otoscope, bandage cuff, sticker sheet, and of course, Doc's magical light up stethoscope! Now your little Doc can practice her skills and nurture her favourite toys back to perfect health. The Doc Is In!